Indonesia is a lucrative market for many foreign investors as Indonesia’s economy is booming, the country has a huge population and Indonesia has abundant natural resources. Besides setting up a Limited Liability Company (PT PMA or PT Company) or investing in an existing local PT company in Indonesia, foreign investors are also permitted to open a Representative Office in Indonesia. It will be the smartest and most advisable to open a Representative Office in Indonesia first before opening a limited liability company in Indonesia if foreign investors are unsure as to whether their preferred business will become a success in Indonesia. Do note however that the business activity of a representative office in Indonesia is limit to only supervise and coordinate the business and branches. It is not permitted to make any business transactions for imports, exports or even domestic trades between both, companies or people in Indonesia. The current president of the Republic of Indonesia, Joko Widodo, commonly known as “Jokowi” signed into effect a new regulation on March 2016 changing the requirement to start a PT PMA company in Indonesia. Based on the new regulation, you would be required to have an initial paid-up capital of IDR 10 billion (USD 750,000.00). Representative offices, on the other hand, do not have any capital requirement. That being said, you would not be required to be bound by the strict regulations to prepare a big sum of money as you can still establish a market presence in Indonesia at a very low costs. A representative office requires a much shorter time to set up in Indonesia unlike setting up a Local Company (PT) or a PT PMA which requires an estimate of 23 days to set up the company. The registering process varies depending on the types of representative office chosen. Similar to other Limited Liability Company in Indonesia, you would be able to hire both foreign and local employees in a representative office in Indonesia. However, in accordance with Article 4(3) of BKPM Regulation 22/SK/2001, the Chief Representative of the representative office is only allowed to employ foreign employees in the representative office if they possess the relevant expertise for the job. They would also be required to obtain a work permit, a non-permanent stay permit (KITAS) and a work permit (IMTA). 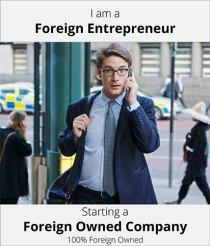 You can read more on how to employ a foreigner in Indonesia here. An established representative office is allowed open a corporate bank account just like any other companies in Indonesia. It will enable a better and faster way of transactions within Indonesia and also with its parent company. Unlike forming a PT or PT PMA company in Indonesia, it is a much cheaper option to set up a representative office. Unlike the PT company which only allows local ownership and also the expensive capital requirement of IDR 10 billion for a PT PMA company, you can have a 100% foreign control over the legal entity and there are no directors or shareholders requirement in a representative office. This is commonly known as Kantor Perwakilan Perusahaan Asing (KPPA) in Bahasa Indonesia. By setting up at KPPA, it allows you to create a market presence in Indonesia and similar to PT PMA, a KPPA is usually set up for management reasons. However, its roles are limited to managing, coordinating, supervising, liaising, and representing the main company. A notarized letter of intent. Once all the paperwork and documents were collected, then you should submit the following applications to BKPM and a license. The license will be valid for a period of three years but with the latest regulation laid out by BKPM, there will be no limitations on the extension of the license. A foreign bank can open a representative office in Indonesia. The purpose of this is to act as a liaison office between the customers in Indonesia and the foreign bank. Do note however that this representative office would be required to comply with the regulations set out by Bank Indonesia (The Indonesian‘s central bank) as their activities will constantly be monitored. Act as supervisors on the projects in Indonesia that are partially or fully financed by its related offices (main office/branch) outside of Indonesia. Assist in supervising credit collateral in Indonesia for its main office/branch outside of Indonesia. In accordance to to Article 1 paragraph 29 Regulation of Head of Investment Coordinating Board (Badan Koordinasi Penanaman Modal/BKPM) Number 15 of 2015 Concerning Guideline and Procedure for Licensing And Non-Licensing Investment (“BKPM Regulation No.15/2015”), KP3A is an office which is lead by an Indonesian citizen or foreigner who is designated by a foreign company or joint foreign company overseas, as its representative in Indonesia. To conduct market research on the items required by the companies/users in Indonesia as well as providing information about the terms of the export of goods to companies in the Indonesia. A foreign construction representative is also commonly known as the Badan Usaha Jasa Konstruksi Asing (BUJKA) in Bahasa Indonesia. Unlike both of the previous representative office as mention earlier, the Ministry of Public Works regulates the construction sector alongside with BKPM. You would be required to obtain a permit to operate in the construction area. This is also known as the Surat Izin Usahanjasa Konstruksi (SUIJK). However, it is a crucial point to note that only large companies can qualify for the license. This license is valid for a period of three months with the possibility of further extension. Appoint foreign or local manpower to manage the representative office. Although the strict regulations might seem like a major disadvantage to many companies, you can still pursue other activities with an agent for the parent company. 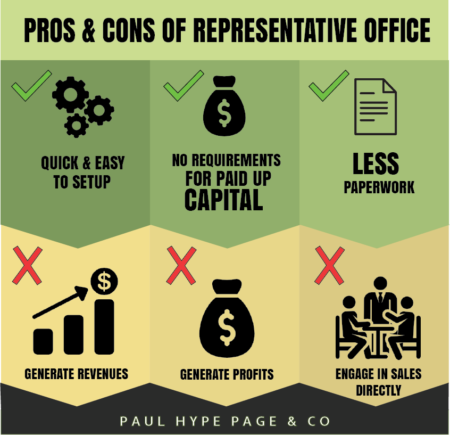 It actually depends upon the type of representative office and there are 4 options to consider. For foreign investors intending to expand their business to Indonesia, a representative office will be a great choice. You can set up a branch, but with certain major restrictions. With this form of business entity, you are not allowed to generate revenues or perform any business transactions directly under the name of the representative office. You should also own a main company overseas to manage the representative office in Indonesia. Most of the representative offices focus on conducting market research as well as marketing for the company through selling or buying agents. Some foreign investors choose to set up a representative office in Indonesia before establishing a PT PMA to promote their company first. With different types of business entities, there are both pros and cons. If you do not have prospective clients in Indonesia and wish to explore your business perspectives in this country, it might be better to open a representative office instead of a PT PMA company first. There are various advantages and disadvantages of opening a representative office in Indonesia. 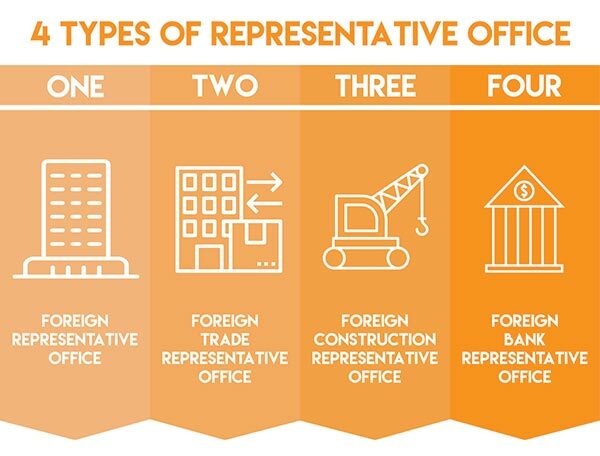 Among all four types of representative office, the first two options are the most popular among foreign companies. Establishing a foreign representative office (Kantor Perwakilan Perusahaan Asing – KPPA) allows you to create a market presence in Indonesia. A Foreign Representative office is usually set up for management reasons. The roles are limited to supervising, managing, liaising, coordinating and representing the main company. Once all the paperwork has been submitted, BKPM will issue the license, usually within one month. The license is valid for three. With the new regulation for BKPM, there are no limitations on the extension of the license. According to the Minister of Industry, all Foreign Trade Companies or Joint Enterprise (Association) of Foreign Companies that are interested in setting up their representative office in Indonesia, are required to obtain a license SIUP3A (Surat Izin Usaha Perwakilan Perusahaan Perdagangan Asing) from the Ministry of Industry and Trade of the Republic of Indonesia. Only Foreign individuals or Indonesian individuals with high educational background and related experiences are eligible to manage the representative office. Both Foreign representative office and Foreign Trade representative office are not allowed to generate revenues, profit or engage in sales directly. To establish a Foreign Trade Representative Office, the application process is the same as for Foreign Representative office (KPPA). The only difference is that all documents such as the Letter of Intent or Letter of Appointment must be signed by a notary in the country of origin and legalized by the Indonesian Ministry of Foreign Affairs. Unlike the previous two types, the construction sector is regulated by Ministry of Public Works and also partially by BKPM. A SIUJK permit (surat izin usaha jasa konstruksi) is required to operate in the construction area. It is important to note that only large companies can qualify for the license, which is issued for three months with the possibility of extension. To establish a Foreign Construction Representative office, all the necessary documents must to be submitted to the Ministry of Public Works and the administration fee must be paid. The fee can amount to either $5,000 in the case of construction consultancy services sector, or $10,000 if target sector is construction implementation services. Apart from the same requirements as for a Foreign Representative Office, several documents must be submitted along with the application to prove that the main company is reputable. The opening of a representative office must have permission from Board of Governor of Bank Indonesia. Any banks that intend to open a representative office in Indonesia should have a total asset of which ranks top 300 in the world. The application letter should be signed by the Director of the bank and addressed to the Board of Governor of Bank Indonesia. A letter of approval to open a representative office in Indonesia will be given by Bank Indonesia within 30 days after all completed documents is received by Bank Indonesia. With regard to the application process, Bank Indonesia will check the of the documents and conduct an interview with the candidate of head of representative office.